2018 has been a significant year for the Ahmadiyya Jamaat in Italy. 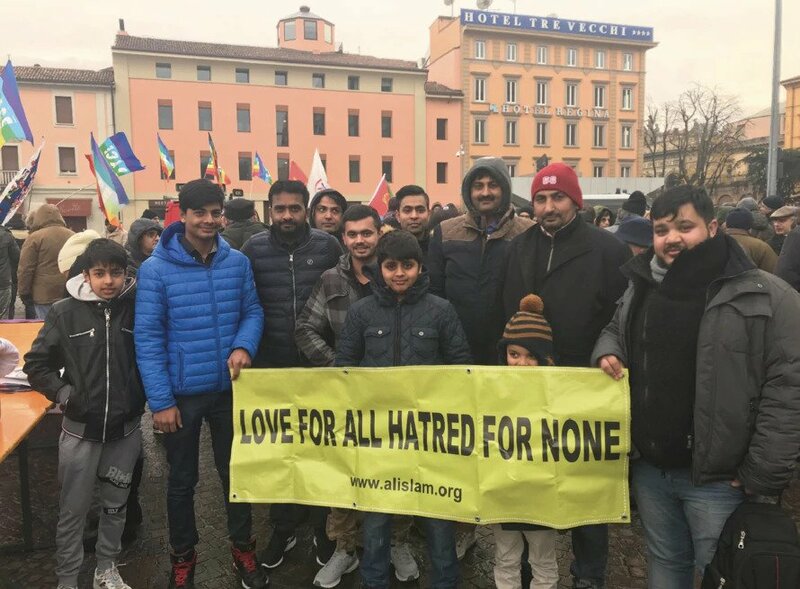 The very first day began with a Peace March in the Centre City of Bologna, in which we also had the opportunity to represent the Jamaat and its peaceful message to all the participants of the march. A group of brave Khuddam and Atfal participated on this very cold day to represent the true message of Islam. 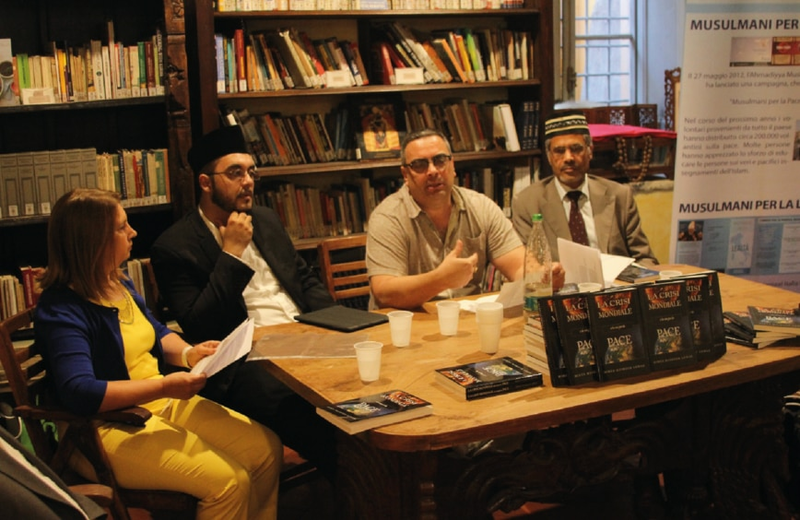 Later on 16 January, the Jamaat in Italy, was introduced at an event on religious freedom in the Italian Parliament for the first time. 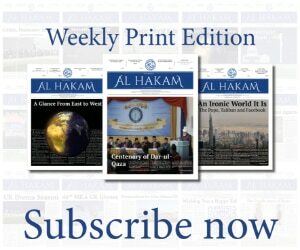 The members of the Jamaat delegation consisted of the Abdul Fatir Malik Sahib National President, Mohammed Akram Sahib General Secretary, Rana Naseer Sahib Sadr Majlis Ansarullah, Kashif Kamal Sahib Sadr Majlis Khuddam-ul-Ahmadiyya, Shoaib Ahmad Iqbal Sahib Secretary Umur-e-Kharija, Mohammad Afzal Sahib Sadr Jamaat Rome, Arsalan Afzal Sahib a Khadim from Rome and myself. During our presentation, the picture of the Promised Messiahas was shown. As the topic of this presentation was on the history of the opposition and persecution of the Jamaat, I was told by the national general secretary, Mohamed Akram Sahib, that it was very difficult to hold his tears when the picture of Hazrat Maulvi Abdul Latif Shaheedra was shown during the presentation. Many politicians, academics and religious leaders who participated in this event expressed their regret of having little knowledge of the Jamaat and were looking forward to getting to know more about the Jamaat in the future. In March, a delegation of academics and journalists participated at the UK Peace Symposium. Dr Luigi di Salvia, President of Religions for Peace also had the honour to address the participants of the symposium and to sit with Hazrat Khalifatul Masihaa. A world-renowned scholar on religious movement, Prof Massimo Introvigne also participated in this event as a member of the Italian delegation. Another highlight was Jalsa Salana Italy, held from 11 May to 13 May in San Pietro in Casale in the Suburbs of Bologna. Hazrat Amirul Momineenaa graciously appointed Laiq Ahmad Atif Sahib, President and Missionary of Malta Jamaat as his special representative. We were all surprised that the number of participants had increased by around 30% this year and, by the grace of Allah, we were able to manage the unprecedented number of participants. Among other non-Ahmadi guests was the world-renowned Catholic scholar on Islam, Prof Dr Zannini who currently holds the chair on Tafsir-ul-Quran at the Papal University of Islamic Sciences (PISAI) in Rome, Italy. Also, Mr Louis Bono Deputy Ambassador of the United States to the Holy See (Vatican) traveled with his wife and children from Rome to participate at our Jalsa. In his address to the participants, he highlighted his pleasure to be with the Ahmadiyya Community in Italy and the concerns of the US Government on the lack religious freedom in some countries. A delegation of academics and journalists from Italy then participated at the 2018 UK Jalsa. Among them was the religious priest and orientalist scholar, Prof Justo Lancuba who has been a close advisor to Pope Benedict and previous popes. Another important member of the delegation was Prof Di Marzio, who is the director of a Research and Study Centre on Religious Freedom in Italy (LIREC) and who wrote a very positive and impressing article on the Jamaat, which was circulated among the academic elite in Italy. It was also planned for the Honourable Prof Emanuela del Re, Deputy Minister of Foreign Affairs of Italy to participate at the Jalsa, however she had to change her plans due to other official commitments. Nonetheless, she sent her greetings to Hazrat Khalifatul Masihaa and expressed her concerns on the persecution of the Ahmadiyya Community and stated, “Italy stands beside all those who are unjustly persecuted”. On 13 October, Jamaat-e-Ahmadiyya Italy held its first Peace Symposium in Parma, a detailed report of which has already been published in Al Hakam, on 14 December 2018. Aside from this, the Jamaat has held various presentations on the Italian translation of Huzoor’saa book, World Crisis and the Pathway to Peace. Among other locations, such presentations were held also in Bologna, Parma, Florence and Rome. Of course there have been many more tarbiyat and tabligh events organised during this year and we hope and pray that Allah accepts our humble attempts to convey the message of Islam Ahmadiyyat to the Italian people.